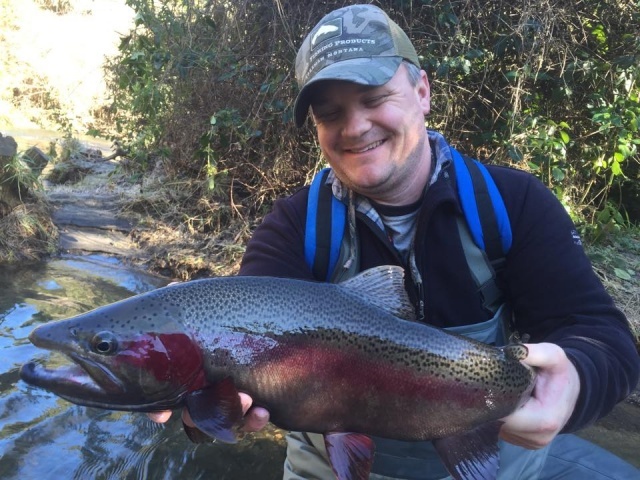 Conditions continue to be perfect through most of the central north island to pursue winter fishing for spawning trout. I have been out with clients over the weekend and last week but also wet a line myself on a number of occasions. Again the Hine has been pumping , this is the fishery of the year and somehow continues to produce plenty of running fish along with some reasonable sized fish. It doesn’t seem to matter what time of day it is, brightness or cloud cover, naturals or glo bugs this river is producing to those who know it. They are getting great numbers through the trap up the top and fish are certainly moving through the river quickly during the day. The water has remained quite high in here forÂ a few days which has encouraged fish to move but also made things favourable for fishermen. Rain and fresh conditions are amazing things for running rainbow trout and with this winter being the wettest we have had forÂ a few years we are certainly seeing good seasons from most waters. I also poked my nose in the TT for the day but unfortunately hit it when it was back to clear conditions and I think we missed the bulk of the fish which went through a few days prior. We caught fish but they were all dark jacks which seemed to be milling around in the slower water. 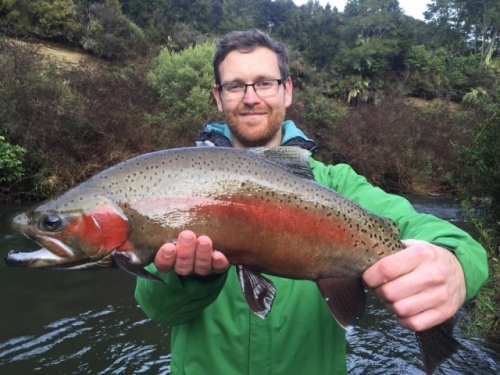 On the same day we hit the Tongariro for the afternoon and again dragged a few fish from the Judges pool area. I spoke with some anglers on the same day which had given the Blue pool area a fair hiding and they had done ok with a mixed bag of trout. My father rang in early this morning with good results from the Stag pool and surrounding riffles including a good sized brown he had secured which was pleasing to hear. Angling pressure on Monday seemed to be fairly low. Lake anglers are reporting all sorts of results but none very encouraging – the best coming from the Delta fisherman. 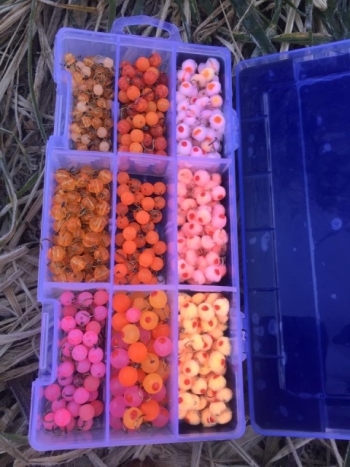 Jigging , deep trolling and harling have all dropped off now but certainly should fire up as soon as there is a change in water temperature as the days become longer. It would seem most of the fish are up the rivers currently, Im kind of hoping for no further high water or flooding as this will leave good numbers high in river systems for summer fishing. 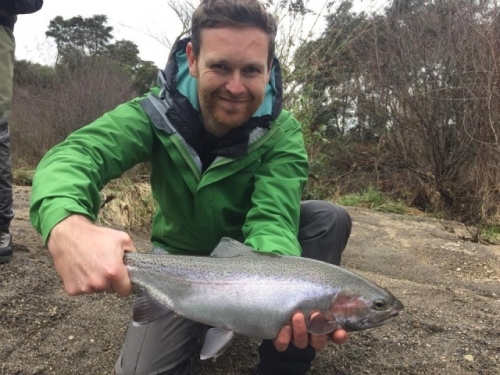 Raft fishing is one of my things that I do over summer months and the upper Tongariro will again be a popular trip in which we will spend a lot of time on the water. I raft with RNZ which are a awesome company to be on board with, we have worked together for many years now and have the raft fishing options sorted-check out the videos we have done on the home page regarding these trips. This year will be bigger than any other with new trips planned. Photo’s attached are of clients from the week just gone, as you can see some cracking fish were taken. Thomas Andrews is one of the best fisherman I have guided over the years and certainly knows how to fish with weight when needed. A fisherman of this calibre at this time of year it was not suprisingÂ for him to pluck 30 fish from the Hine in our half day session we enjoyed together. Other pics are of a Stag party that a group of guides were working with over the weekend, these guys were lots of fun and even though not fisherman the Hine is still a place which novice anglers can be taught to catch trout for the first time. We lost quite a few, saw heaps , landed a good number and one poor fisherman went home very wet after trying his best efforts to retrieve my flies from a snag, got a love that commitment.